IshkaNexus » Blog Archive » What’s all this about the Flower of Life anyway? What’s all this about the Flower of Life anyway? Many people love the Flower of Life. Many people like it, but have no idea what it is. Many people in the tribal/visionary art community think it’s so cliché. I personally LOVE this pattern and embrace it whole-heartedly for countless reasons. I continue to educate people about this amazing geometrical form whenever I can, and remind others why it is held so sacred, lest they forget. I think sometimes it’s easy to take for granted the beauty in something so simple. But I think that’s because most of us take life itself for granted at some point. We wake up, we eat, work, sleep, and we do the whole thing over again everyday until we die. If we’re not careful, we can be on auto-pilot our whole lives. Sometimes we need a reminder, a wake up call to existence. Luckily, as easy as it is to forget ourselves, it’s just as easy to come back to presence. When we take a moment to observe the smallest simplest things in our surroundings, we discover immeasurable beauty, as well as immense gratitude for it all. The Flower of Life is held sacred because it represents all of creation. Its beauty is both simple in form as well as profound in its implications. On paper, it is pleasing to the eye as a balancing mandala of dynamic symmetry, and looks like what it’s named after: a flower, with six petals, based on many overlapping circles. From this six-fold geometry, in three dimensions we find the structure from which all animated and organic life forms on this earth are born. It holds the geometrical framework for minerals, all those beautiful crystals humans regard in sparkling revelry. It contains the shape of a multi-cellular embryo in its first hours of life, a new baby. It carries the fundamental expression of sound, music, and even language. It literally bears the template from which all Platonic solids spring from, the building blocks of all life! For thousands of years, many cultures have revered this exquisite design, and have derived much spiritual expansion from it, knowing even without the aid of today’s modern technology exactly what it represents. I believe the knowledge of this map of creation was given to us long ago through deep meditation and shamanic practices, ways of perceiving and communicating beyond the everyday. Today’s science has given more people immediate access to understanding our world and how it works, hopefully expanding our amazement of it all, and in retrospect, developing a greater appreciation of the spiritual mysteries of yore, as well as of today. Our innate curiosity and fascination with life and all its creation is discovered and propelled by the information that sacred geometrical forms, such as the Flower of Life, transmit. They are maps. They are keys. What joy to hold them in our hands, crystallized in a painting, distilled in our minds. 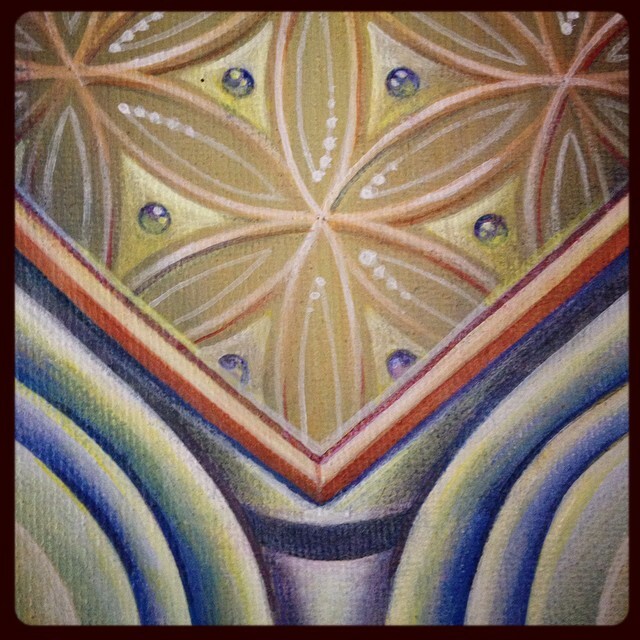 Note: Image above is from part of a painting commission I did last year, showing only a piece of the Flower of Life. This entry was posted on Sunday, August 9th, 2015 at 8:24 am	and is filed under Uncategorized. You can follow any responses to this entry through the RSS 2.0 feed. You can leave a response, or trackback from your own site.